First, you should consider the space that you will use carpet for the flooring. You need to know if the area is a high or low traffic zone because high traffic areas need certain types of carpet in them. You need a carpet that won’t mat over time or show tracks in them. 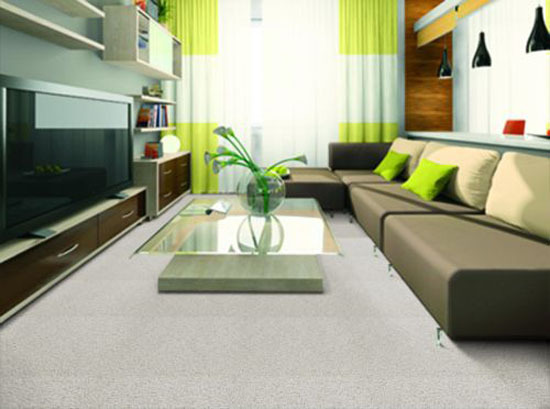 Trackless carpets are perfect for high traffic areas, such as a living room or dining room. Also, in high traffic areas or rooms where there will be a lot of kids or pets, you should have a carpet that is stain resistant and easy to clean. We have many carpets that will work well in high traffic areas. Color is a big part of every part of interior design. You need to pick just the right color of carpet for your home, and make sure to pick something that will go with the other design colors you use in the home so you won’t have to change the carpet so often. Choosing the right color of carpet is fun to do after you figure out what kind of color will work best. First you have to decide if you want the carpet to make a bold statement or if you want something more neutral that will blend. This year grey carpet is really in style, and it is considered one of the new neutrals. However, you can pick any color you want, whether that color be black, pink, sage, light blue, or even taupe. It’s all up to you. Also, if you don’t want a solid color carpet then there are many carpets with different flecks of color in them, which help hide dirt better than single-color carpet. Fleck colored carpets also add a nice visual internet without being too bold of a color. We have many great colors of carpets to choose from. There are many different styles and textures of carpet to choose from, and the best way to figure out what you like best is to go to a store and feel the different carpets. Every different style has their own pros and cons, so you really have to figure out for yourself what feels more comfortable for you. Also, if you find a carpet that you like, we can always send carpet samples so you can see and feel the carpet in person before placing an order. Nobody ever plans to spill or drop anything onto their carpet, but accidents and messes happen. 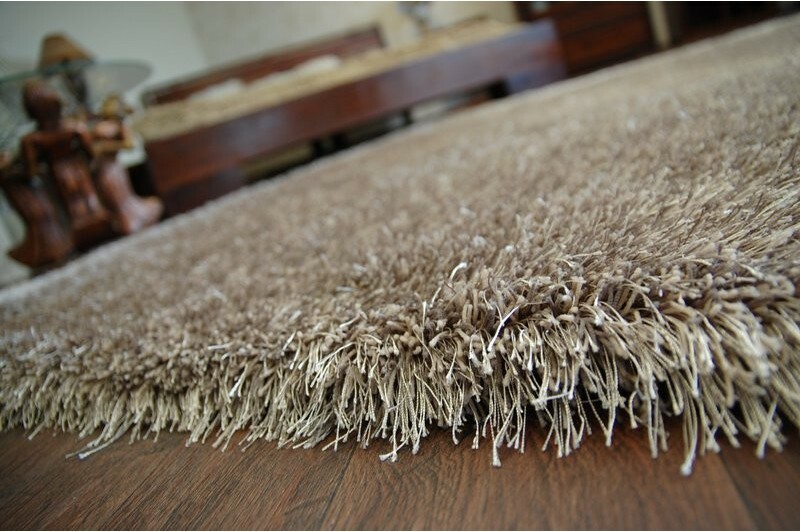 Having a carpet that is easy to clean and that has a stain and soil resistance is essential for every home. We have many great carpets from the top manufacturers that feature stain and soil protection systems. 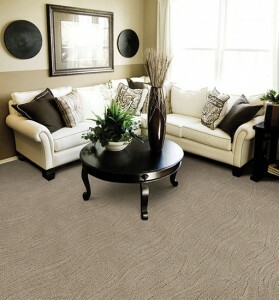 We also have all of the new SmartStrand Forever Clean carpets from Mohawk, that are very easy to clean. Make sure that the carpet you buy is CRI Green Label Plus certified, which means that the carpet has very low emissions of Volatile Organic Compounds. 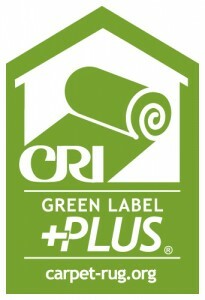 Buying a carpet that is Green Label Plus certified means that you are buying a carpet that is safe for your home. You won’t have to worry about harmful fumes leaving the carpet and bothering you or your family. We have many Green Label Plus certified carpets, and you can tell which product is Green Label Plus certified because the products will have an icon on the product page. When picking out a carpet, pile height and density are also important to keep in mind. I would recommend getting a sample of the carpet you like, and then gently bend it so you can see if you see any of the carpet backing. If you barely see the carpet backing or if you don’t see it at all, then the carpet will be a great choice for your home. 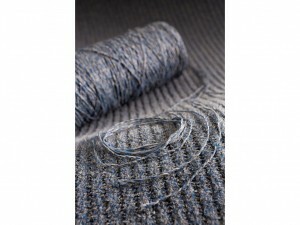 There are many different carpet fibers to choose from. We have some great solution dyed nylon and polyester carpets that will keep the color for years, since the color is all the way through the fibers. SmartStrand carpet is also a great option because most of their carpets feature the SmartStrand Forever Clean fiber that is easy to clean and it doesn’t lose its color. Many of our carpet fibers have web pages dedicated to them that will give you more details about the fibers and how they work. We have many great carpet pads to choose from. Most carpets only need a 7/16 carpet pad, either a 6lb, 8lb, or 10lb. Our most popular pads are the 7/16 8lb carpet pad, and our two moisture barrier pads. The moisture barrier pads help protect the sub-floor, and they also trap the water on top of the barrier so you have more time to clean up the spill before it really tries to soak deep into the carpet. Click here to see our selection of carpet pad. Always check the warranties on the carpet that you want to buy. 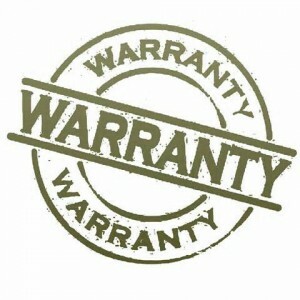 We include all of the warranty information on our product pages. 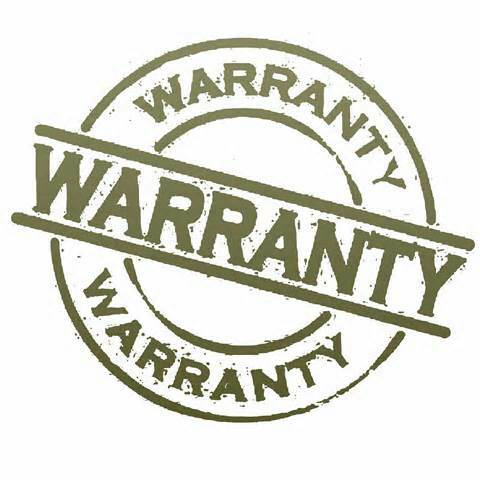 Just scroll down the specific carpet product page until you see a warranty tab, click the tab, and there you will find a list of warranties and a link to show you a more detailed warranty description. Be sure to budget ahead of time for the carpet, carpet pad, installation, and if you need the installers to move any of the furniture or not. 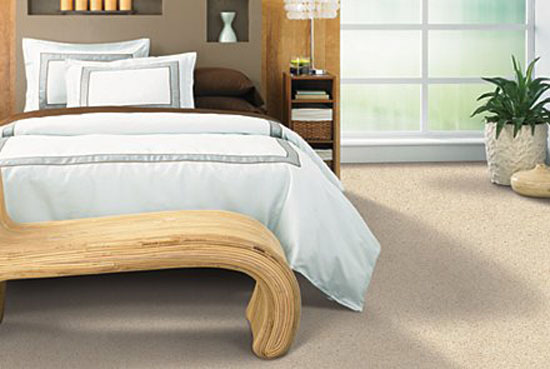 The best part about carpet is that you can get a gorgeous carpet and a great quality pad at a reasonable price. We have many carpets that will fit any budget. Choosing the right carpet might seem overwhelming at first because there are so many options, but once you figure out exactly what you want and need, it’s not that difficult anymore. If you would like some recommendations, then please call one of our sales reps at 1-800-922-5582. They can help you find the right carpet for your home or business. Click here to see our great selection of carpet. This entry was posted in Carpet, Do It Yourself, High End Carpet and tagged 10 tips, Carpet, cheap carpet, flooring by Tiffani. Bookmark the permalink. My wife and I are looking at getting new carpet in our bedroom. I liked how you pointed out that the amount of foot traffic a space gets plays a big part into the type of carpet we get. 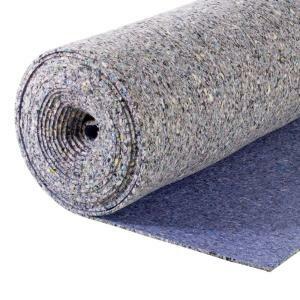 Seeing as how we are the only ones that go through our bedroom, I’m sure we could get a carpet that is a little softer and more delicate since it won’t see a lot of wear. Thanks! One of our sales representatives will be happy to help you find the right carpet for your room. 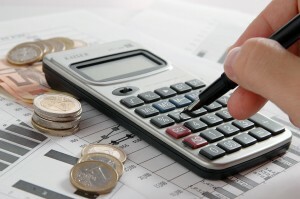 You can reach a sales representative at 1-800-922-5582 or a sales rep can email you. We have a lot of great options in stock. My wife and I just finished remodeling our living room, but we can’t decide on a new carpet that we like. I think getting a sample of the carpet you like to test the height and density is a good place to start. Hopefully we can find a carpet that doesn’t back at all so we know it can handle high-traffic areas. Thanks for sharing! My husband and I are hoping to find a great carpet that we can have installed soon, and we are wondering how to pick the best one for the service to put in. So I like your suggestion to find one with a great warranty so that you can be sure the rug will last for a while. 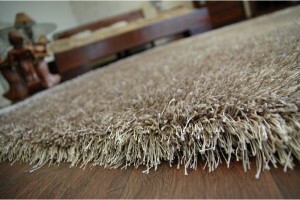 We will definitely have to find a carpet that has a warranty on it offered by the installation service. I agree that you want to feel the carpet before you choose it. It would be good to consider this because it would be really nice on your feet. My brother needs to get new carpet, so he’ll have to find someone who is qualified to install it. I am so excited because I am getting new carpet for my living room and bedrooms in my home this summer. You make a great point that you should choose carpets that are stain resistant and easy to clean. This is very important to my family because I have two kids who make a lot of messes and it will be great to clean the carpets quickly and easily. Also, I think it is important to choose a carpet that will match the theme of the rooms. I like how you said you need to pick just the right color of carpet for your home and make sure to pick something that will go with the other design colors you use in the home so you won’t have to change the carpet so often. I am thinking of finding a nice beige color. Thanks for the tips on choosing a new carpet. My husband and I are building a new home and the time has come to pick out carpet. Thank you for pointing out that there are many different fibers to choose from. I’ll have to look into finding the right carpet and carpet cushions for my house. If you see any carpets on our website that interest you, please send in an online request or call a sales representative at 1-800-922-5582. We will be happy to send you samples and get more information about the carpets for you. If you’ve decided on carpets for your home then there is a lot that you have to keep in mind when choosing them. The article makes a very important point about the cleanability of the carpets. After all, if a mess is made you’ll want to be able to clean it up quickly and easily before it can stain your carpets.